Even though surgical procedures are intended to save lives, unsafe surgical care can cause substantial harm to patients (as described by the WHO Safe Surgery programme). In developed countries, nearly half of all adverse events in hospitalised patients are related to surgical care, and at least half of the cases in which surgery led to harm could be considered preventable. Many of these checks may not be feasible in emergency surgery, however checks should be completed where possible if they do not cause the patient any harm. The pre-operative marking of a patient has a significant role in surgical safety, and can prevent wrong-site surgery. Surgical marking should ideally be made by the operating surgeon, as part of the surgical check in the ward checklist. The site must be re-confirmed during the intra-operative ‘Time Out’ checks. The correct site for surgery must be confirmed by checking against the patient’s records, consent form, operating list and, when possible, verbally with the patient (or appropriate family members). An appropriate skin marker pen must be used and the mark must be an arrow that extends to near the incision site* and should remain visible after the application of theatre drapes. When performing laparoscopic surgery, the side of the structure being treated must be indicated by a pre-operative mark on the skin, in proximity to the structure being operated on. For digits on the hand and foot, the mark must extend to identify the correct specific digit. *Ensure the mark does not extend onto the intended incision site, as this can result in the permanent ‘tattooing’ of the patient due to the involvement of the ink with the surgical incision. 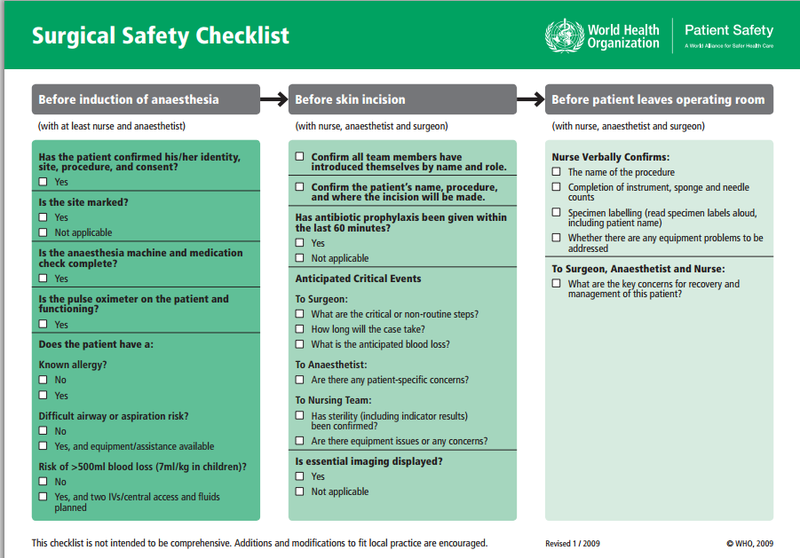 The WHO surgical checklist is an essential part of surgical safety. The use of the checklist has been shown to reduce the rate of major post-operative complications from 11% to 7% and mortality rate following major operations from 1.5% to 0.8%. The checklist must be completed for all surgical interventions, ranging from general anaesthetic operations to local anaesthetic interventions. A registered theatre practitioner should take the lead in completing the document. 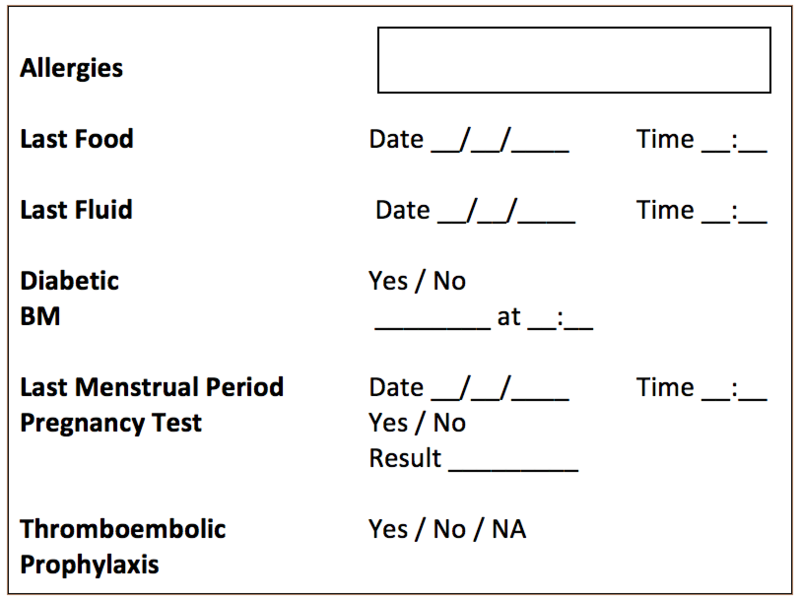 A copy of the completed checklist must be retained in the patient’s notes or electronic clinical record. Prophylactic antibiotics are given to counter a high risk of wound infection or in regions where infection causes severe consequences (such as a prosthesis). Antibiotics are typically given as a single dose IV (extra doses may be needed in prolonged surgery or excessive blood loss), within 60mins before the first incision. Examples of prophylactic intra-operative antibiotics are given in Table 1. Which of the following is NOT part of the WHO Surgical Safety Checklist? Which of the following are prophylactic antibiotics NOT indicated?